I sincerely thank you for stopping by and taking a look around. I’m the Author of Night of the Living Cuddle Bunnies. 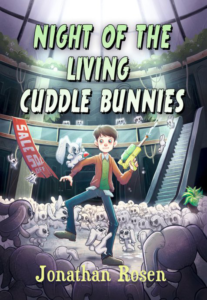 Night of the Living Cuddle Bunnies, is the first in a scary/funny series being released from SkyPony Press. It follows the adventures of twelve-year old, Devin Dexter, and his cousin Tommy, as they navigate their way through the creepy town of Gravesend. In Night of the Living Cuddle Bunnies, they’re convinced their new neighbor is a warlock, but nobody believes them, not even when reports come in, that the hot new Christmas toy, the Cuddle Bunny, is starting to come to life all over town. Can Devin and Tommy convince everyone, before Gravesend is overrun by the cutest, evil toys ever? Please keep checking back for future updates.